The Heritage of Cebu monument is a tableau built by renowned artist Eduardo Castrillo featuring some of Cebu’s important heritage sites and events. 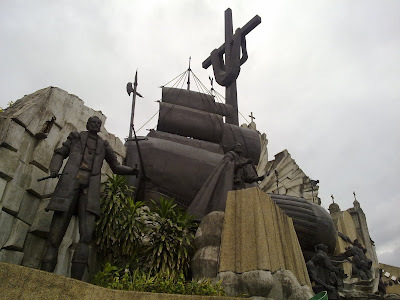 This project was commissioned by the Archdiocese of Cebu, which was then turned over to the city government, was in turn recently turned over to the officials of Barangay Parian where this monument is located. Great perspective, looking at the monument from below. Can't help but wonder the significance of the serpent on the cross...hmmm maybe that's it. interesting post and great shot of the monument. That is dramatic and amazing. Captivating photo...I love the angle it is taken from! Wonderful! enjoy the subject and perspective -- thanks for sharing your photo! I love the angle on this one- great shot! Great shot. I've been to Cebu but I didn't see this, is this new? I wish we had interesting statues like that. All the statues around here are of politicans. I love the perspective on the shot; it creates a bit of an optical illusion. I can't even tell how large the monument is? Good stuff!